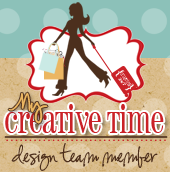 Hello My Creative Time friends!! Today is day #2 of January's Sneak Peek week at MCT!! Did everyone enjoy their weekend? I actually got some crafty time to myself! YAY me! Anyways, I'm so excited about this new release! It just might be my favorite..so far!! Emma out did herself again!! This new stamp set is from the MCT More Gift Card Sentiments.I made the gift card holder using the Embossed Gift Card Holder die I used DCWV Adhesive Fabric Paper. I had to run the die a few times through my machine but it worked! Yes its fabric! I added Velcro to the gift card so it can later be used as a brag book or mini album. I made this for my niece who is expecting her first baby. I love how it turned out! Thank you for stopping by and dont forget to visit the rest of the DT. Big hugs! I love all the pink! Very cute!! So pretty and girly! I love that you added Velcro to it for the baby album! What a clever idea to use Velcro! Love it!! Very cute love the pink. Love your project. It is just adorable! this gift card holder is so cute! This is so sweet! How cool to make it out of fabric, and the velcro was a great idea! Very pretty gift card holder! I love that you made it from fabric paper! Love the pinks you used - great project. I love the fabric and the sentiment! This release is going to be awesome. Thanks for sharing! Pretty in Pink! Very sweet gift card holder! This is SOOOO sweet and pretty!!! LOVE the soft colors!!! Awwww this is so pretty! This is absolutely beautiful!! I love the colors!! What a great card. Loving the colors. Love the little ruffles on the top. Very pretty. So glad to see some baby sentiments. Pretty gift card holder. So very clever to make the gift card holder into a brag book that can be used later. Great idea! Your card is beautiful. Beautiful gift card holder! Love the velcro idea! Pretty in pink! Love all the embellishments, also. oh I love the idea of closing the holder!! awesome! I love your holder beautiful. This is so pretty! You did a great job on it. So pretty and great idea to use fabric. Your creation is so adorable. Thanks for sharing. Such a pretty GC holder. Very pretty gc holder! Love the pink. TFS. Your Baby Shower Gift Card Is So Beautiful!! Just Love It!! So Pretty...love the idea of the velcro so she can use it later as a small brag book!! What a cute, feminine way to present your gift card. Love it! Just PRECIOUS! Love your music too! Love this, what a great idea. Thanks for sharing. Love this gift card holder, TFS, Have a great day! This is just adorable, I love it. TFS. Beautiful gift card holder! Love it! Your gift card holder is so cute!!! I love the colors!